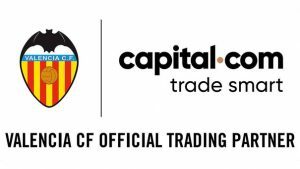 Valencia CF name capital.com as their official trading partner! Home / International Football / Spain / Valencia CF name capital.com as their official trading partner! The company ‘fintech’ Capital.com has become LaLiga side Valencia CF’s new sponsor – the first in the club’s history in the online investment sector in financial markets – until the end of the season. Capital.com is an innovative company that combines trading, artificial intelligence and personalized advice to operate in more than 2,000 markets, including stocks, currencies, cryptocurrencies, etc. Their technology provides personalized information to customers to optimize their investments, as well as free courses on how to operate on the stock market, financial information and videos, through its commercial platform and the ‘Investmate’ application. The company’s main offer is a web and mobile platform available in 53 countries to operate through the so-called CFD investment instruments. Their website, which offers up to 15 payment methods, is available in Spanish, English, German, Norwegian, Swedish and Dutch. In this platform, users also find a wide range of relevant and specific information about the markets to be able to operate more successfully, with news about those markets of more volatile or popular interest and changes in the prices of financial assets. Capital.com, which is beginning to hit the Spanish market strongly, is, according to the awards of European level Forex 2018, the most innovative broker and offers the most transparent services. In addition, it was considered the best trading platform in 2017. Previous XtraTime VIDEO: Mohun Bagan prepares for Indian Arrows match! Next 10-Men Churchill Brothers hold Real Kashmir FC to stay unbeaten away from home!